More fruit and nuts than loaf! You could call this our version of a ‘kletzenbrot’ (kletzenbrood) but without the ‘kletzen’. Kletzen is the Austrian word for a type of dried pear. 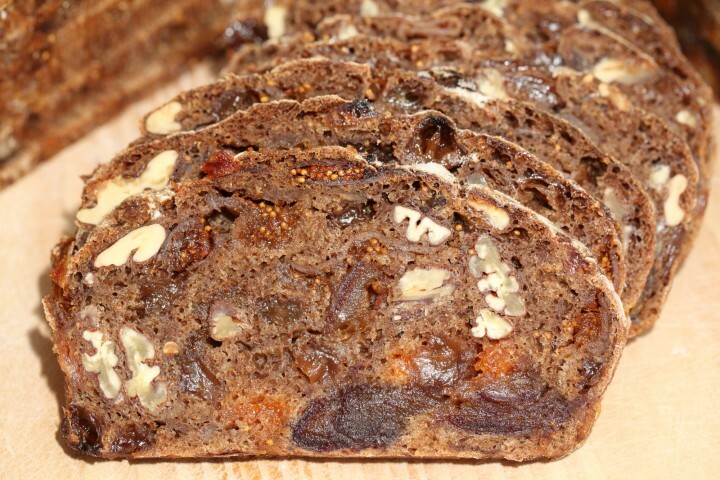 But this bread will be great with any type of dried fruit you love. Recently we did manage to find some dried pears, so we will be using them for a version of this loaf soon too. My father has now officially stated that he likes this bread better than pie. I can understand why, it has its sweetness, but the taste is much more complex, with the rye and nuts and spices. Sliced thinly and paired with good cheese it is a very (full)filling thing to eat, especially during these winter months. We can highly recommend making it in the weeks leading up to Christmas. You can make a few loaves in advance, slice them thinly and store in your freezer, it will keep for many weeks. Wash your dried fruit and leave it to soak in hot water for one hour. We add about 50 grams of rum to the hot water, which is very nice, but you can replace the rum with water of course. Strain and keep the fruity liquid so you can use this flavored water in the recipe! Cover the bowl with cling film and leave the fruit to absorb the remaining moisture overnight so the fruit will be moist but not wet when you use it the following day. You can decide for yourself if you want to cut the fruit in pieces. We do not do this, because when the loaf is ready we cut thin slices from it and the fruit and nuts get sliced anyway, plus this way it looks more appealing to us. The whole process on this day will take over 9 hours, so it is wise to plan and maybe start early. Measure the fruity water from the soaked fruits and add some more water so you will have the right amount of water for the dough (200 grams). In the bowl of your standing mixer, combine rye flour, bread flour, sourdough starter, salt, spices and the fruit water to your dough and mix for one minute, until everything comes together (of course you can also do this by hand). Cover and leave to rest for 1 hour. Now knead the dough for 5 minutes (10 by hand) until you have a smooth and somewhat sticky dough (it will cling to the bottom of the bowl). Because of the large amount of rye flour the dough will feel more like a paste than a regular bread dough. Again cover and leave to rest for 1 hour. Take the dough out of the bowl and press it into a flat rectangle. Distribute the soaked fruit and the nuts evenly across the dough. Roll up the dough and pinch and mold the dough so all the fruit and nuts are well distributed (see pictures). Cover and leave to rest for 3 hours. Divide the dough in two equal pieces and shape into balls or oval shapes if you prefer. Place the balls onto a tray covered with baking paper, or in bakeable baskets, like we did. Cover the loaves and leave for their final proof. This will take about 3 hours, depending on the temperature of the room and dough. Preheat your oven to 200 ºC / 390 ºF. To get a nice crust, try to create some steam in your oven by putting a small metal baking tray on your oven floor when you preheat the oven and pouring in half a cup of hot water immediately after putting the bread in the oven. Release some steam by setting your oven door ajar (perhaps with the help of a wooden spoon or oven mitt) 5 minutes before the bread is ready. After placing the breads in the oven turn the oven down to 170 ºC / 340 ºF (starting higher and then turning down, is done because by opening the oven door and adding the steam you may loose heat very quickly). After 55 minutes of baking your loaves are ready. Place them on a rack to cool. Store the bread in a paper bag after cooling and leave to set and ripen for about 12 hours before slicing. This way it will be easier to slice and the taste will have improved further. 1) Shaping is still my biggest challenge. In the absense of bakeable baskets (which are no longer in your shop? ), how tightly should I be shaping the balls before placing them on the baking sheet? I notice you don’t do pre-shaping and shaping (presumably because there’s not much gluten to develop), does the dough not spread? 2) I have a couple of American-sized loaf pans (about 23 x 13 cm), which works out to about the same surface area as 15 cm rounds. Given my aforementioned shaping issues, would you recommend using the loaf pans? 3) You don’t mention anything about pre-heating a baking stone, do these just get baked on a baking sheet without pizza/bread stone? Yes, you are right, the baskets are not in our shop at the moment or in the near future, but that is no problem and should not keep you from baking the loafs. Maybe you can indeed be creative with other molds and baking paper. But it should be no problem to bake them without molds, they normally will not spread. 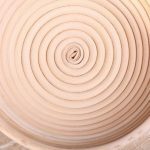 The shaping is more like molding clay almost. You are right, it works and feels different than your average wheat dough. 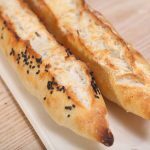 There is no need to bake these loaves on a baking stone, you can use a baking sheet or place your loaf pans on a rack or tray. The oven temp and time are the important factors for a good result with this fruit filled loaf. Hope it will be great! Thanks! Baked on a sheet, no spread. My rye starter was a bit sluggish, I suspect I should have given it longer to ripen/rise. So they came out very, very dense, but quite nice. Yes, they all act different. Always more important to take the time needed than to exactly stick to the indicated proofing times with sourdough. Also if possible measure the temperature of your dough with a probe thermometer and transfer the dough to slightly warmer surroundings (You can use your oven as a proofing cabinet, ever so carefully warmed up to around 25 to 27 Celsius). Hi there, in the process of making this bread. Am I right that the dough does not really rises in the first 2 hours. How big is the 2 breads? Is it pie size? I’ve got the feeling I’m doing something wrong, there was no way I could put all the fruits and nuts in the loaf, but I’m making ice cream with the leftovers, so no harm done. Yes, because of the use of rye flour and the amount of filling, the rise is there of course, but not very noticeable, like you would see in a standard loaf. The size of the molds we use is 15cm in diameter. In this loaf there’s more filling than flour, so, as you can see in the picture, a lot needs to be incorporated in the dough, so it is a bit of a challenge, but if you stick with it, everything will come together, even though at first it seems a bit impossible. Hope you will give it another try. Can the loaves be baked in cast iron pot? This is how I bake my regular sourdough bread but at a much higher temperature? We must admit we have never baked this recipe in a cast iron pot. 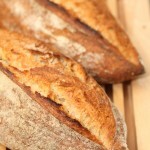 If you want to try it, we would advice not to go as high as with your sourdough, because of the high fruit content. This might also stick to your pan, so lining it with baking paper would be an idea too. Absolutely great to read your excellent feedback, thank you so much and happy holiday baking and sharing! I am a beginner baking by formula. Is it correct that you are measuring all ingredients by weight? Including water? I’m sorry to be so stupid, but I’m an American, and my mother never had a kitchen scale – only measuring cups and spoons. Thank you so much. Yes that is correct, we also weigh the water. We weigh everything, it is the way to get consistent baking results. Measuring by volume can seem quick and easy but tests have shown that variations in amounts are considerable. Baking is an exact science and measuring with cups and spoons can lead you to diverge by as much as 10 to 20%. Also when weighing small amounts of yeast and salt we find our scales of great value. We want to applaud you for going in this direction and hope it will proof to be easy and comfortable for you in no time. I so love d idea of this bread. 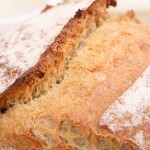 In absence of rye flour, cud I use whole wheat flour n white bread flour in 1:1 proportion? Yes, that is no problem, it will be different but also good we are sure, although we have never tried it with anything but rye flour. We think you might use a bit less of the fruity water, because of the difference in absorption. But you really need to see the flour in this loaf as a way to bind the fruit together. In that way it is very different from a regular loaf of bread. These loafs look very appealing. Can you tell me how the temperatures and times would be when baking with a Rofco oven? 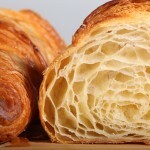 Hi Rik, we bake them at 200C and turn down the oven to 50C when we bread has reach a nice color. This way it will cook all the through without getting to brown. The times on 200C depends on your Rofco type and the number of loafs loaded. This looks wonderful! How much sourdough culture should be used to make the sourdough starter? Maybe I missed it somewhere but would you be so kind to explain to me the differences in the mentioned sour dough hydration percentages in the different recipes? (Or lead me to the right place where you perhaps already mentioned it before?). I have a really good starter in the fridge as a basic. I presume that’s ok to work with? Wij werken in veel van onze recepten met voordeeg (denk aan poolish en biga, combinaties van meel, water en desem) dat we de avond voor de bakdag bereiden. We gebruiken daarbij maar 15-20 gram desem per brood. Met deze kleine hoeveelheid desem maak je een volledig actief voordeeg gedurende de nacht. Dit gebruik je vervolgens in het uiteindelijke deeg. Op deze manier onderhoud je dus een klein potje desem en krijg je toch je echte zuurdesembrood. Omdat je een klein beetje gebruikt van het desem maakt het ook niet zoveel uit wat precies de verhouding / hydratatie percentage is van je desem, omdat het maar een een paar gram water meer of minder gaat op het totale recept dat je uiteindelijk toevoegt. (Veel recepten op internet gaan ervan uit dat je bijvoorbeeld 250 tot 500 g desem maand in maand uit moet onderhouden, wat ervoor zorgt dat je bij weinig bakken heel veel (kostbaar) meel moet weggooien. Onze methode met het poolish / voordeeg stapje zorgt ervoor dat je een klein desem kan onderhouden, toch veel kunt bakken en heel weinig hoeft weg te gooien. Veel recepten, die van professionele bakkers afkomstig zijn, houden geen rekening met de behoeftes van de thuisbakker om kleinere desems aan te houden, want zij zijn gewend iedere dag grotere hoeveelheden te gebruiken). Dus als je onze recepten volgt kun je gewoon je eigen desem gebruiken en hopelijk met goed resultaat. I have successfully tried a number of your recipes and I now would love to make your variant of kletzenbrot, however I fail to find dried sour cherries. In itself not a major problem as I will be replacing them with dried cranberries which have a similar refreshing sour and sweet flavour. But I just wondered, where do you get your dried sour cherries from? Hello Jan-Pieter, you can indeed use any kind of dried fruit with this recipe. We buy our dried sour cherries at www.jangotje.nl/ look under Gedroogde zuidvruchten, Bessen. Happy baking! 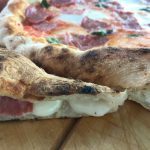 Does it work with yeast instead of sourdough? Hello Elena, no problem to use yeast instead of sourdough starter. Just add about 5g of instant dry yeast to the dough. You also need to add an extra of 50g water and 50g of whole rye flour to compensate for the 100g of sourdough rye starter. Happy baking!